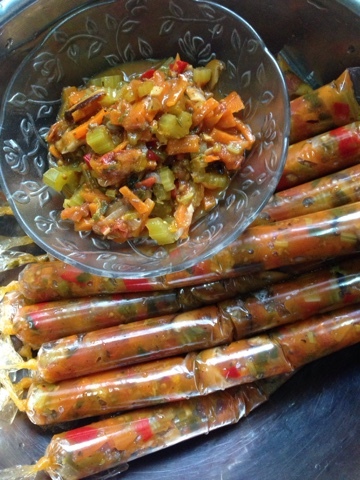 I can't be bothered to cook everyday, so I've made this sauce to complement any protein by freezing a whole batch. 1. Panaskan minyak zaitun. Masukkan bawang hingga harum. 2. 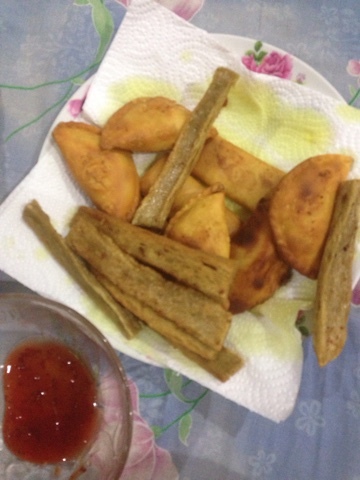 Goreng cendawan. Masukkan air, masukkan bahan-bahan lain. 3. Masukkan herba2, garam dan lada sulah. 4. 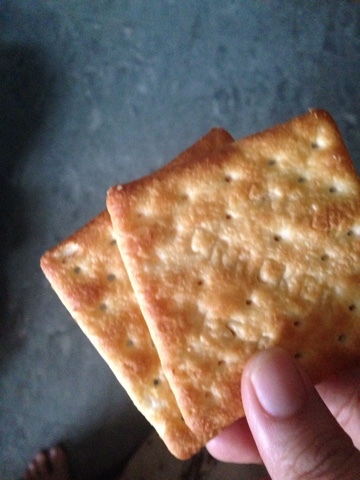 Biar mendidih, kacau-kacau, sampai air surut separuh. 1. Heat oil. Fry onion and garlic until translucent, add in mushroom. 2. 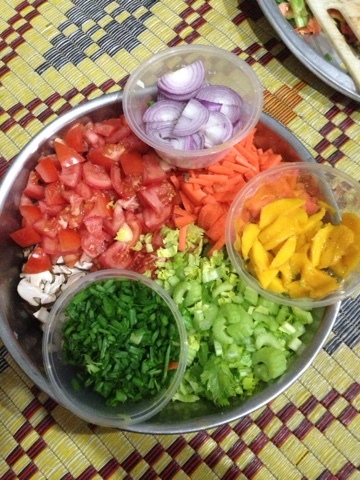 Add water and other ingredients. 3. Add herbs, salt and pepper to taste. 4. Let simmer until reduce to half. Could be freeze up to 1 month. My apologies for lack of post and updates, as my phone is broken, and I still haven't get it fixed. 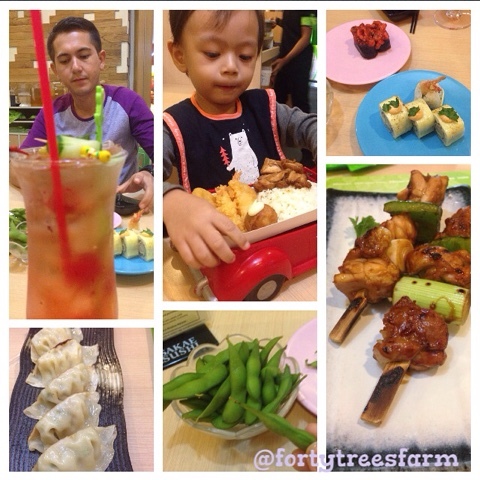 The end of year was filled with good comfort food, family time and dramas. Thankfully the farm has been broken into after the last time, the plants are thriving, although a few of it died due to feral pigs, we replanted 20 chili plants to the ground yesterday. The start of the new year makes me evaluate my priorities and decisions for the past year. I've always been rash, jumping both feet and whole body to a plan that I think perfect to escape the current situation I'm in. I spend quite a few nights too on who am I, and do I like the person I've becoming. I was always searching for the "It". You know, the one thing we lived for. I had this conversation with my sister last year, on how another sister "It" is her family, and that I have many things I'm passionate about and that she have none. Yesterday, I assure her she have "It", her friends, family and her penchant for fun. While we are in the conversation, she pointed out that how much I love domestic stuff. I wanted to deny it, I thought, hey that wasn't me. I'm this glamorous, flirty vixen who just happen to love doing stuff with her hands... Okay yes I love being a domestic goddess. I just didn't realize it, since I love baking, cooking, sewing, creating stuff, and gardening. And so, I finally (for the 103 time) find my calling. So happy new year everyone, may you find all that you love, and may you love who you become. So we celebrated our anniversary a day earlier. We choose japanese restaurant, cause I love them and he wanted to taste. 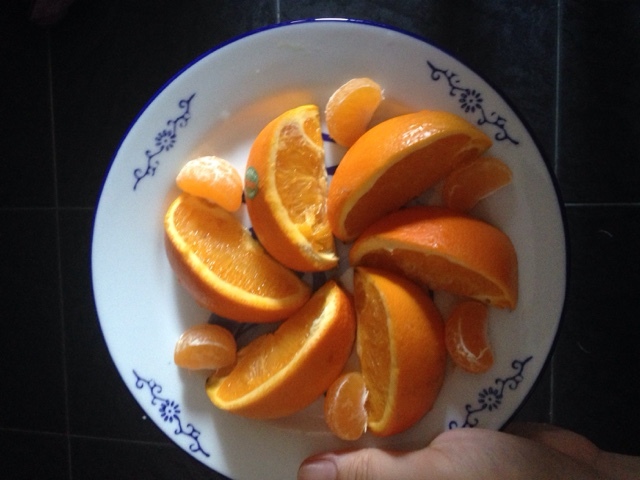 Breakfast, I had 2 type of oranges and 3 crackers. 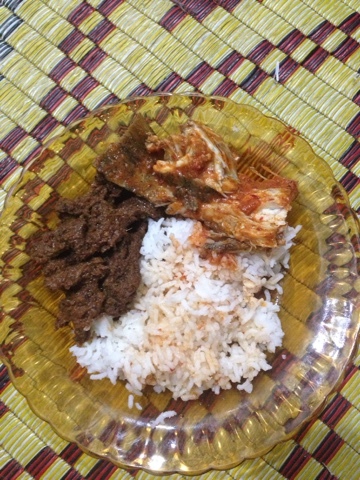 And for lunch, white rice with side dishes. And another tiny orange. For dinner, we ate little portion of everything, but he said it wasn't very tasty. And the next day, my weight increased to 84.9, maybe due to all the white rice I ate. So the next day, it's all less carbs. 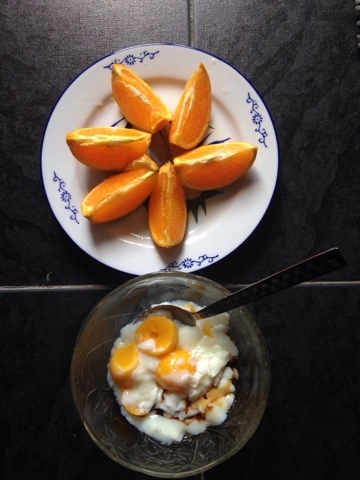 2 oranges and 3 half boiled egg for breakfast and lunch. Bake a cake and cupcakes, and make veggies soup and veggies omelette, with the prawn sambal and rendang my mom made earlier. 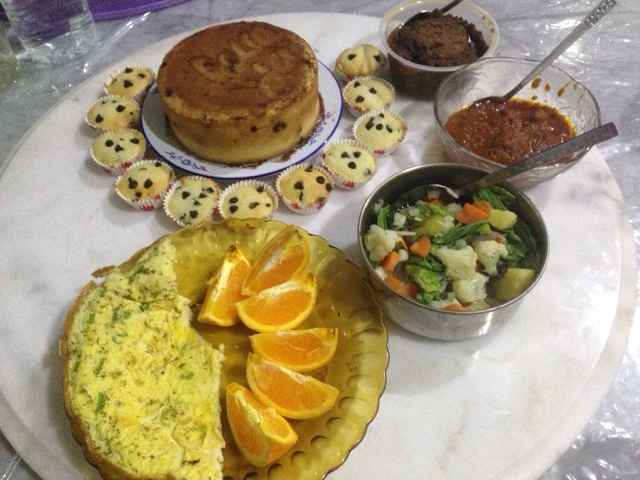 This is what I ate along with 4 cupcakes. Happy fourth anniversary love! My goal is next anniversary I'm fit and more gorgeous. Lol. The feelings when you pushed yourself and get rewarded with the scale pausing a little lower, the clothes loose and toned body. So proud. Yesterday I was out the whole day, but I did take breakfast with 3 half boiled egg, but only ate 1 1/2 since I shared it with Keyaan. Followed by a freeletics exercise, rested a while before showering and went out to help my sister. We went to Lavender for lunch, and I choose chicken chop with the fries replaces with salad. 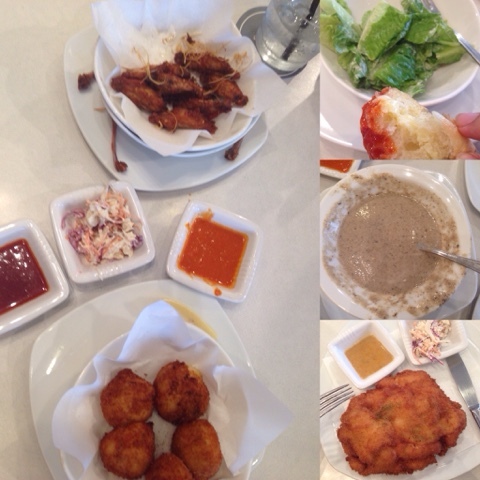 I ate 2 potato balls, 2 chicken wings, 6 spoonful of mushroom soup, a pinch of bread, and 3/4 of my chicken chop. Oh and ate all of the salad. 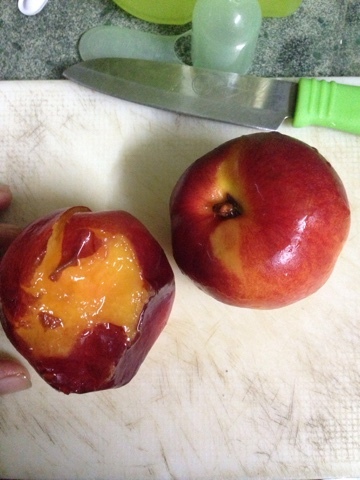 For dinner I ate 2 squashed nectarines, which are bloody expensive, but doesn't taste that good. 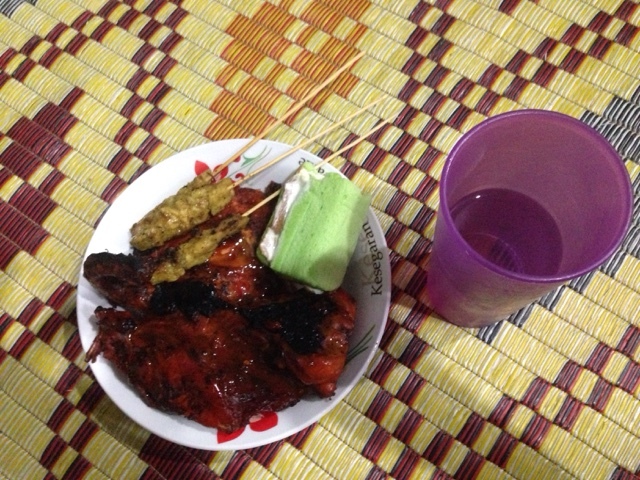 After that I ate leftover cake, 3 leftover satay as well as the chicken I supposed to eat the day before. The chicken looks huge but barely any meat. Today, I still weighted 83.6 kg. 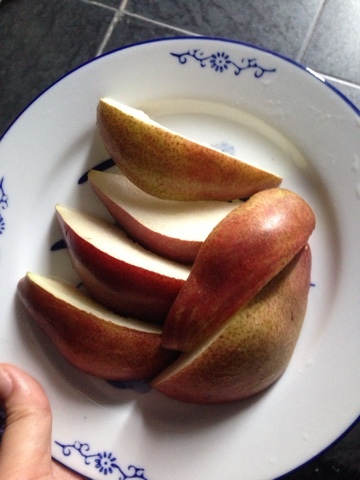 My legs are less sore, so for breakfast I ate anjou pear, super sweet and delicious. Then proceed to eat 3 keropok lekor, 2 currypuff and 2 popiah. 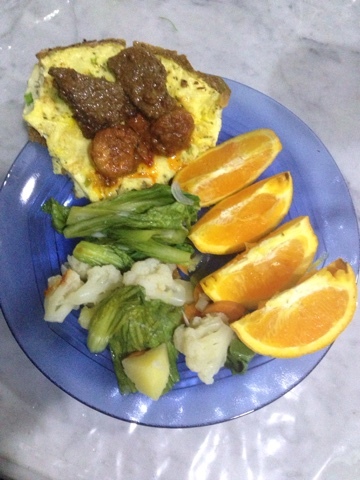 Its 5pm and still haven't eaten lunch yet. 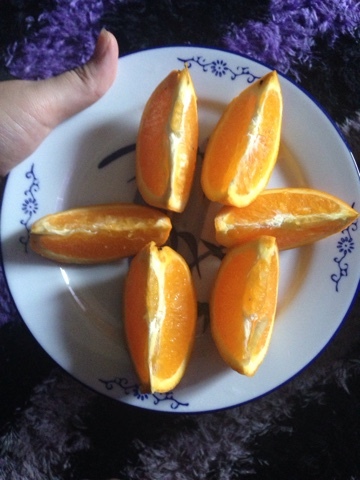 Sometimes I want to eat a lot so I stuffed myself with fruits. And other times, like today, I don't feel like eating much. I did two rounds of freeletics, and I think I died, halfway of second round. My legs, my abs, my hands are all sore. Ate 2 currypuff 15 minutes after freeletics. 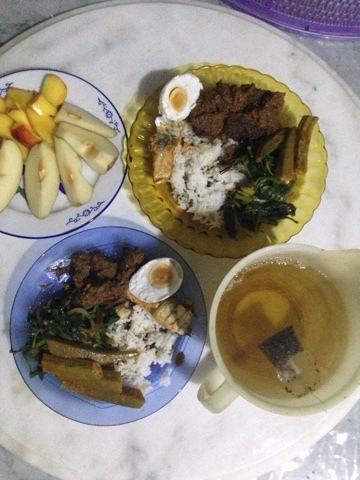 Dinner, 6 slices of beef, 1 slice of fish, 4 okra, 1/2 salted egg, 1/2 cup veggies, 1/2 cup white rice, pear and nectarine with warm green tea. Blue plate is mine and yellow is his. Keyaan ate a lot today, probably happy that his dad is home. Growing up, he despise most of the green and eco-friendly way his family values, and yet, now he's trying to instill the same core value for his little family.No stranger to composting, solar energy, as well as the three R, he's the man to rely on to work hard in the farm. The nature lover, he love nothing more than running through the farm, playing with his toys on hills and climbing trees, and occasionally playing with the animals he found, scaring his mom. Forty trees to plant, forty kilograms to get rid of.